It's almost Christmas! Only two more days until Christmas Day. I hope you all have a fantastic holiday season. Spend time with your friends and family and eat a lot of sweets this week! Here are some my favorite holiday traditions below! 1. Looking at Christmas lights! I always love seeing all of my neighbor's decorations each year. They are some of my best memories. Driving around town is so much fun, blasting Micheal Buble and taking pictures of lawn ornaments. This movie is a classic. I love everything New York and this movie is a great way to celebrate the city through the eyes of a young girl at Christmastime. 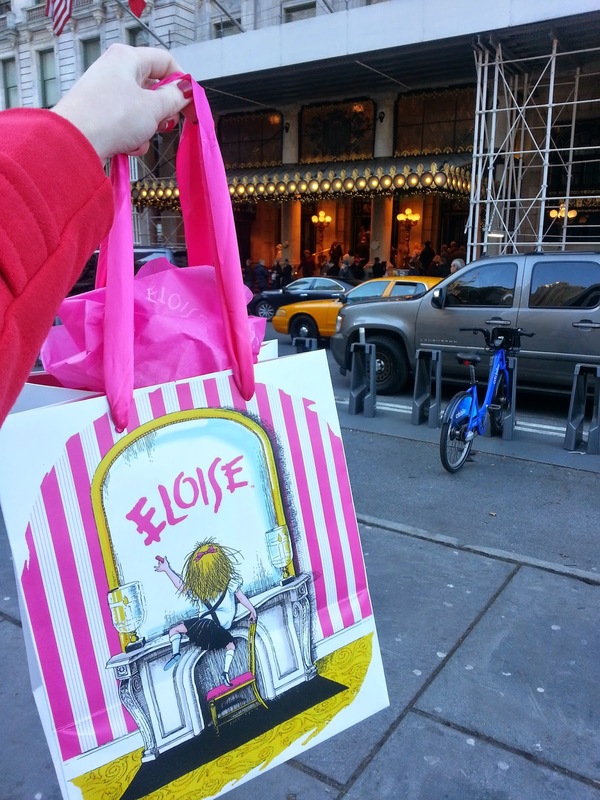 I have been to the Plaza Hotel where Eloise lives and they have the most adorable area dedicated to her. I also have pink hot chocolate & the cutest mug from there! My family & I send out Christmas cards every year to our friends and family. I enjoy making them unique and festive. I include nice photos of my sister and I from throughout the year that documents some of our favorite memories. Since I was a little girl my family and I have attended our local church's Christmas Eve service. We sing holiday songs and remember what Christmas is really about--celebrating Christ and spending time together as a community. I dress up for this event and look forward to seeing everyone from my town this time of year. Since I love fashion so much, I always enjoy finding cute outfits to wear this season. From red dresses, to black tights, to high heels, I use this time of the year to go all out. Pictured above I am in a Christmas sweater and leather skirt (this one is so cute!! & cheap from F21 for only $17.80) for a holiday party I went to. You have to add a bold red lip once in a while for this season, and I am wearing this one from Milani above. What are some of YOUR holiday traditions !? How cute are you!! Love your holiday traditions! Your tree looks so pretty! !